Rackspace(s rax) is putting the OpenStack cloud platform into production — or at least getting closer to it. This week, customers can sign up for early access to “Cloud Server, Powered by OpenStack” with general availability of the public cloud slated for May 1, Rackspace CTO John Engates said in an interview. The OpenStack open-source cloud project was launched in 2010 by Rackspace and NASA and gained steam as tech powers including Hewlett-Packard(s hpq), Dell(s dell), Cisco(s csco), Internap and most recently IBM(s ibm) and Red Hat(s rhat) joined the effort. These companies are contributing resources and code to the project they see as a counterweight to the Amazon (s amzn) public cloud juggernaut, which they all view as a threat. Many also see it as a way to keep VMware(s vmw) from parlaying its virtualization prowess from the server room to the cloud. The foundation of Rackspace’s existing cloud is the Slicehost technology acquired a few years ago, but it is moving all its private, public and hybrid cloud implementations to OpenStack, Engates said. Monday’s Rackspace news is pegged to the opening of this week’s OpenStack Spring Conference in San Francisco. Cloud Block Storage: Rackspace’s analog to Amazon Elastic Block Storage, but with a choice of high-performance solid-state disks (SSDs) or cheaper standard spinning disk storage. This service is in beta. Cloud Databases: MySQL-based cloud database services, available in early access form, are based on scalable SAN-based storage. Cloud Control Panel: A graphical interface, available in early access form, for customers who want something more intuitive than a command line to manage their workloads from a centralized place. Cloud Monitoring: This technology, also in early access availability, builds upon Rackspace’s CloudKick purchase to allow customers to watch their infrastructure and applications from a single dashboard. Cloud Networking: Technology built on contributions from Nicira, Cisco and others will bring the benefits of software-defined networks to the Rackspace OpenStack implementation. This technology is coming soon. Engates said he did not want to pre-announce other database options but acknowledged that current Rackspace cloud customers use other databases, including Microsoft SQL Server(s msft). As more of the OpenStack community bring their implementations to the fore — HP unveiled more of its OpenStack plans last week — these vendor partners will compete in earnest, not only with Amazon but with each other. Of course HP, Internap, IBM, Suse and Red Hat itself will also be vying for that honor. Engates said the world of coopetition should be fine with all the players. OpenStack, he said, provides key cloud underpinnings atop which OpenStack proponents can build their own value and compete based on that. Whether the combined resources of these OpenStack frenemies can overcome Amazon’s public cloud dominance remains perhaps the bigger question. In the battle of PR, OpenStack is building momentum. The element to watch is customer preference for solutions leveraging an OpenStack baseline … particularly the advantages of a (relatively) similar approach among multiple vendors. Now, its all in the execution. It is going to be dense. like harvard professor pointed out, some lucrative industries would never be profitable.. for example: Airliners. Interesting. 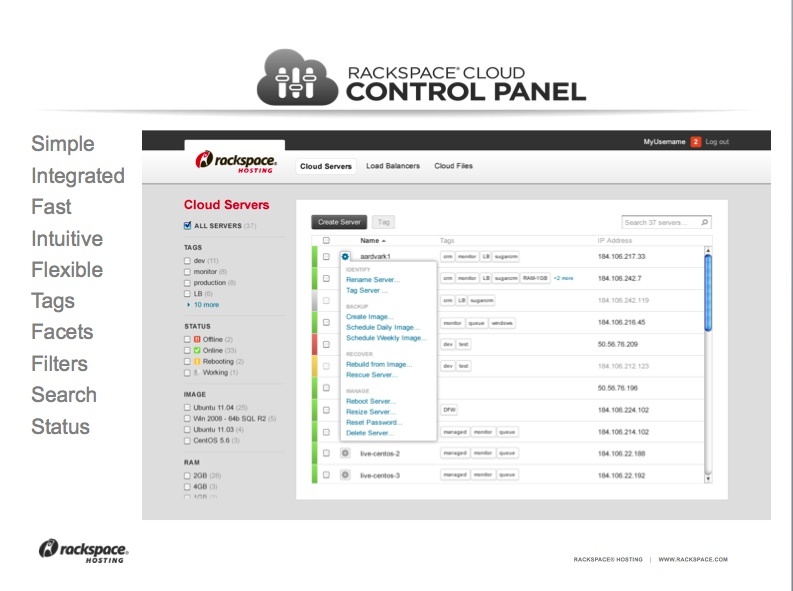 I wonder how much customization Rackspace has to the OpenStack open source baseline. The last time I saw a demo of the open source project it had a long way to go. Almost 2 years in the making you would think they have a product ready for beta. This market will not sit back and wait for the “good guys”. I’ll be curious if others share your view that it’s late (or too late.) AWS continues full steam ahead, that’s for sure. I don’t think it’s too late but it is late. A matter a fact most are late including CloudStack. If I needed a solution today what are my real options? I know it’s not vaporware but it feels like it.